A beautiful ornamental tree with stunning dark purple leaves and frothy heads of pink flowers. A garden-designer's favourite with its dramatic black foliage - similar to an Acer tree but at a fraction of the cost. Flowering from May to June with umbels of rich-pink flowers. Supplied as established plant in a 3L pot - dormant in winter, so have no leaves then. 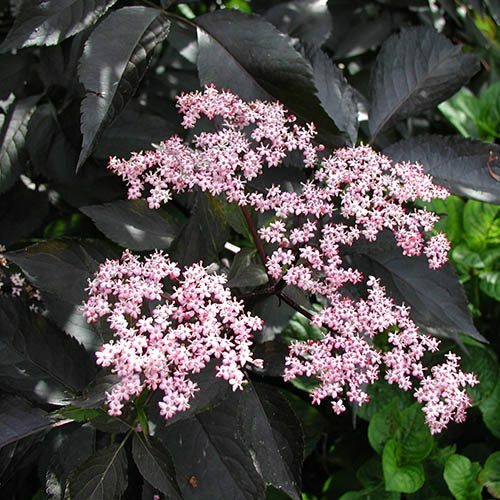 With its dramatic black foliage and beautiful creamy-pink flowers, Sambucus Black Beauty is a real head turner! An ornamental form of the common elder, it's a real favourite with leading garden designers because of its stunning decorative foliage and manageability, plus as a holder of the RHS Award of Garden Merit, it's been judged to be perfect for UK gardens. Flowering from May to June, Black Beauty produces stunning umbels of dainty pink, star-shaped blooms with a subtle, lemon fragrance. These fade from rich pink to pale pink, contrasting wonderfully with its luxurious, purple-black foliage. In autumn the pollen-rich flowers are followed by purple-black, shiny, round berries that will attract plenty of wildlife into your garden. Fully hardy, robust and a breeze to look after, it'll tolerate really harsh pruning too, springing back to life even when cut almost to the ground. As an added bonus, and perfect if you're into growing your own, the berries will make vitamin-rich, home-made cordials and the flowers can be used to make Elderflower Champagne! Supplied as an established plant in a 3L pot, ready to plant straight out. Supplied as an established plant in a 3L pot, ready to plant straight out.. Plant in sun or light shade, and will reach H3m (10ft) x W4m (13ft) - smaller if pruned regularly. Sambucus will grow in most soils as long as they're not waterlogged.